Familiar rivalries and a comeback for the ages were part of the Western New York Club Hockey Championship on Super Sunday at First Niagara Center. 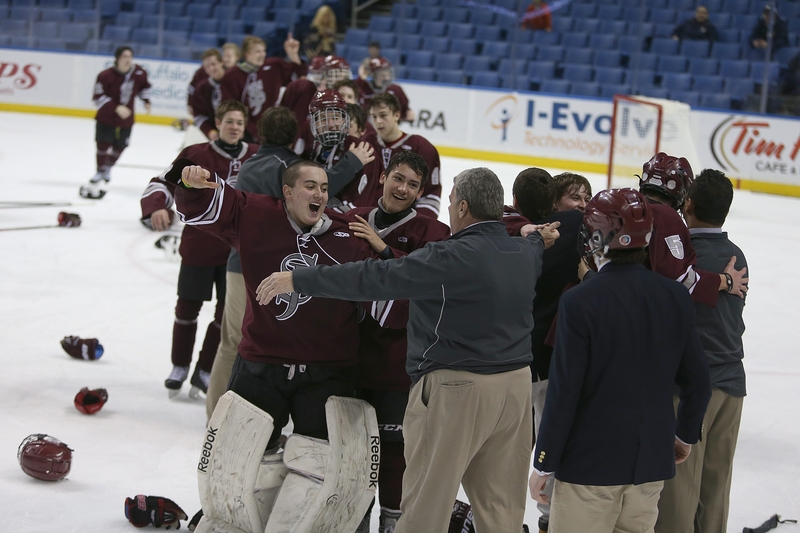 St. Joe’s and Canisius faced off for the large school championship for the second year in a row, with the Marauders avenging last season’s overtime loss, 4-1. Cheektowaga and Starpoint did one better, meeting in the small school title game for the third consecutive year. Cheektowaga won in double overtime last year and needed an extra session again to come out ahead, 4-3. But the performance of the day belonged to the City Honors/Cardinal O’Hara squad, which had lost on this stage four years in a row after winning a title in 2009. Olean looked like it had the mixed division title locked up after two dominant periods after Cam Brickley’s hat trick had the Eagles up 4-0 with just 17 minutes left to play. But City Honors/O’Hara stormed back with a flurry of goals, cutting the deficit to 4-3 just 2:27 into the third period. John Liberti scored his third goal of the game to tie the score with 10:17 left and Collin Rampado put his team ahead for good with 6:38 to go. With seven straight goals and goaltender Rachael Farmer standing tall in the third period, City Honors/O’Hara rallied for a 7-4 win. It must have been quite the scene in their team room during the final intermission. “I read them the riot act between periods,” Dunn said. “When I first came in, it was quiet, we had people feeling sorry for themselves, guys claiming they were tired. I’m not a screamer, but I screamed today. St. Joe’s led Canisius late in last season’s championship game but eventually lost in overtime. This time it was different. The Marauders were able to add an insurance goal midway through the third period and an empty netter to seal the championship. St. Joe’s led 1-0 after two periods but Canisius got on the board just seven seconds into the third when Ian Fitzgerald’s dump in took a funny bounce and found its way into the net. But the Marauders didn’t let any momentum slip away, answering with a goal 10 seconds later to go up 2-1, taking the lead for good. Thomas Heyden was the man on the spot for the Marauders and was rewarded for going hard to the net. St. Joe’s added a power-play goal with 11:23 remaining when Nicholas Wahler’s point shot hit a skate and fell right on the stick of Jacob Donn, who shot into an open net. Peter Masters sealed it with an empty netter. Cheektowaga’s undefeated season was in jeopardy late in the game before a point shot by Jordan Pocobello found its way through traffic and between the legs of the Starpoint goaltender to tie the game, 3-3, with just 1:17 remaining. The Warriors’ top line of Pocobello, Michael Swacha and Anthony Cybulski, which scored all three goals in regulation, came through again in overtime when Cybulski fed Swacha in the slot for the game-winner. All three winners and several other schools will head to Long Island for the state championships next weekend. The action continues today at First Niagara Center with a Super Monday slate of Federation games. St. Joe’s Fed squad will face Bishop Timon-St. Jude at 4 p.m. in the Niagara Cup final. Williamsville East takes on Kenmore East in Section VI Division II at 6:15 p.m. Then it’s Williamsville North against Niagara-Wheatfield in Division 1 at 8:30 p.m.